Fracture and/or dislocations of the proximal humerus are demonstrated. Perform radigraph with the patient in an erect or supine position. (The erect position is preferred and also may be more comfortable for the patient.) Place patient in lateral position with side of interest against IR. With patient supine, place grid lines vertically and center CR to centerline to prevent grid cutoff. Place affected arm at patient's side in neutral rotation; drop shoulder if possible. Raise opposite arm and place hand over top of head; elevate shoulder as much as possible to prevent superimposition of affected shoulder. Center surgical neck and center of IR to CR as projection through thorax. Ensure the thorax is in a true lateral position or has slight anterior rotation of unaffected shoulder to minimize superimposition of humerus by thoracic vertebrae. Collimate on four sides of interest. If patient is in too much pain to drop injured shoulder and elevate uninjured arm and shoulder high enough to prevent superimposition of shoulder, angle CR 10 degree to 15 degrees cephalad. Lateral view of proximal half of the humerus and the glenohumeral joint should be visualized through the thorax without superimposition of the opposite shoulder. The outline of the shaft of the proximal humerus should be clearly visualized anterior to the thoracic vertebrae. 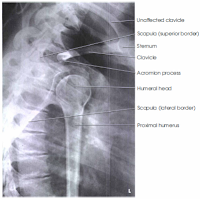 The relationship of the humeral head and the glenoid cavity should be demonstrated. CR and center of collimation field should be at the surgical neck of the affected humerus. Optimal density and contrast will demonstrate the entire outline of the humeral head and the proximal half of the humerus. 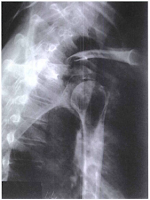 Overlying ribs and lung markings should appear blurred because of breathing technique, but bony outlines of the humerus should appear sharp, indicating no motion of the arm during the exposure.